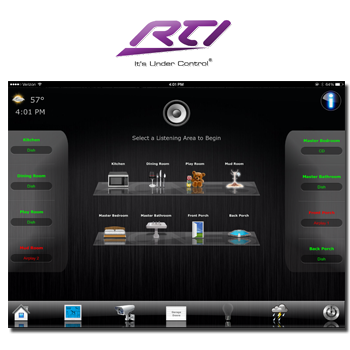 RTI Panel for iOS and Android Devices RTI© home automation systems not only feature award winning in-wall touch panels and handheld controllers, each XP Series system also has the optional RTI Panel mobile application for iOS and Android mobile phones and tablets. This application is completely custom and designed specifically for each of our clients. No two are the same, sometimes even in the same household! Every aspect of your home can be controlled with lightning speed and robust feedback from your tablet or smartphone, from anywhere in the world. 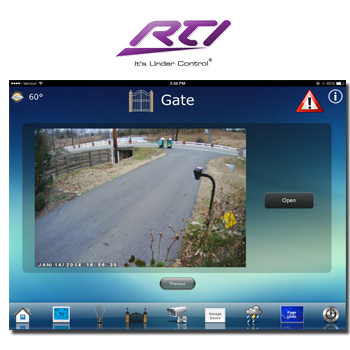 Below are examples of a custom built RTI Panel application for iPad for one of our clients in Little Rock. 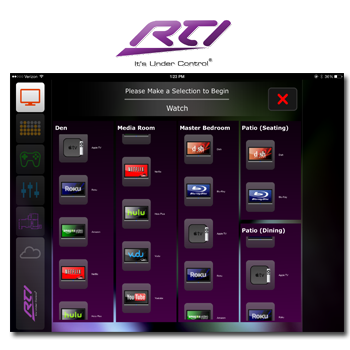 Control of your multi-room audio system has never been easier. Simply select the room in which you want to listen to music, then choose your music source and enjoy the sound of music. No need to leave the room, no need to turn a volume knob on the wall, and no need to turn on the whole house (unless you want to!). It's that easy. In years past, the control of your multi-room system was limited to a volume knob on the wall. Not anymore. In this example our client has control of each audio zone individually. He is currently listening to DishXM in the Living Room and has options to control that zones volume, bass, treble and XM channels. In addition to the current zone, he can also monitor all the other zones, turn on/off other zones and control volume and source for each. All from his iPad without leaving the room. 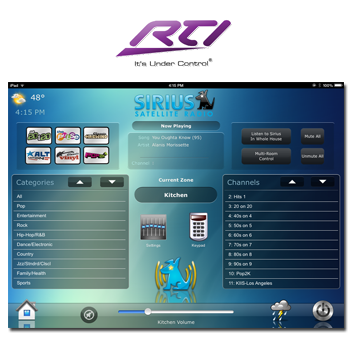 Through the use of two way capable devices such as this Sirius Satellite Radio Tuner, RTI Panel gives you unlimited control of your home audio system. Scroll through hundreds of channels, categories and genres, preview whats playing and store your favorite channels for lighting fast access in every room of your home. . This can be one of the most frustrating tasks in non-integrated homes. Turn on the TV with one remote, turn on the receiver with a second remote, turn on the Blu Ray with a thrid remote and so on. Many times people fail to enjoy their equipment because of this exhausting process to use it. This process is reduced to a button press on the iPad thanks to RTI Panel. Another great feature in this example is the use of shared sources via HDMI matrix. This allows our client to start a Blu Ray movie in the Living Room, pause it, go get in bed, hit play and resume the movie in the bedroom. He can also share sources with the TV's outside by the pool! 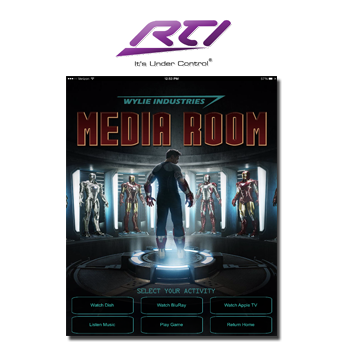 RTI Panel offers unlimited design options that can be tailored to fit each person to their exact specifications or requests. No two applications are the same, therefore you won't find two of our RTI Panel applications that are the same. 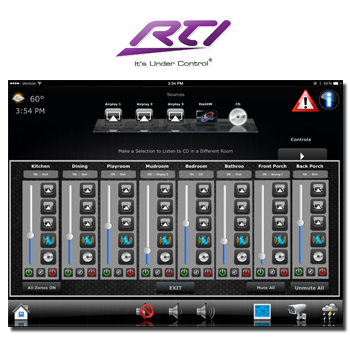 Want to integrate a theme into your control system, no problem! There is no better peace of mind than having the ability to see everything that is happening around your home at any given time. 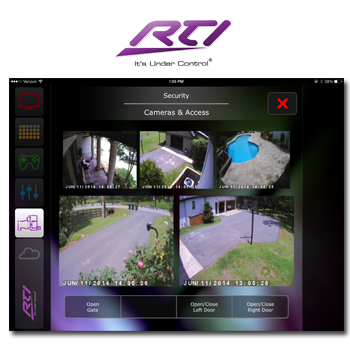 In this example our client can monitor all entrances to his property and home and keep an eye on the kids at the pool by way of his 1080p HD IP surveillance cameras and RTI Panel for iPad. This example looks simple enough right? See who is there, open the gate and let them in. But in this case there is far more to it than meets the eye. When a visitor arrives at the gate and presses the CALL button on the gate keypad a chain reaction of events begin taking place behind the scenes to notify our client of a visitor. The RTI system senses the button press at the gate keypad and powers on the audio system in the Living Room, Master Bed/Bath, Mud Room, Dining Room and Back Porch then sounds a doorbell chime in each room over the speakers. As the system is sounding the chime it also turns on the Master Bedroom TV (if not already on) and Living Room TV and displays the gate camera feed on each. All in a matter of 10 seconds. They can then pick up the iPad and press OPEN to allow access. Very simple solutions for a complex process. Sometimes individual pieces of equipment such as IP cameras, satellite boxes and internet modems or routers need to be rebooted to continue operating smoothly. This could really be a hassle if these devices are on the other side of the house or upstairs right? 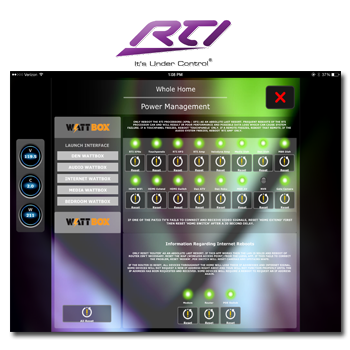 Not anymore thanks to IP power management systems and RTIPanel! One button press from the iPad/iPhone and the device instantly resets!